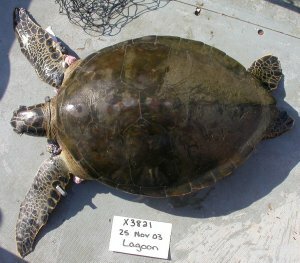 Summary: Fibropapillomatosis is an emergent infectious disease threatening Florida populations of green turtles. FP is most prevalent in marine environments degraded by agricultural, industrial, and urban development, but the environmental cofactors that increase incidence of FP remain unknown. We will use a novel biomolecular technology - a cellular-diagnostic system - to identify environmental stressors associated with increased prevalence of FP. We will compare different parameters among 3 populations of green turtles with differing incidence of FP to identify potential stressors associated with disease prevalence. Our goal is to identify environmentally mediated mechanisms of FP susceptibility and resistance in green turtles, thereby reducing the threat this herpesvirus poses to marine turtles. Project Manuscript: Cellular diagnostics and health of juvenile green turtles (Chelonia mydas): Identifying environmental cofactors of fibropapillomatosis published in Diseases of Aquatic Organisms, Vol 70: 139-154, 2006.